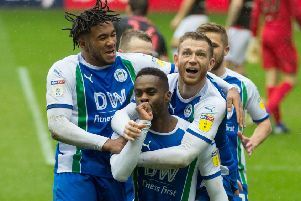 Paul Cook believes the ‘psychological’ importance of going in front was underlined in red marker pen after Wigan Athletic got back to winning ways with a 3-0 triumph over Aston Villa. Latics had won only once in 14 matches heading in, but steamrollered their play-off chasing opponents thanks to goals from Gary Roberts, fit-again Michael Jacobs and Joe Garner from the penalty spot. Cook had bemoaned last week the fact his side had a ‘destructive pattern’ of starting games well only to pay a price for failing to make the most of their opportunities. And he admits fearing the worst when Josh Windass was denied in the third minute by Villa goalkeeper Lovre Kalinic. “I was thinking ‘deja vu’!” Cook grimaced. “These are big moments in games, that have been going against us for so long. “Psychologically, if you go in front, it has an effect on the game. “But this time, for once, all the key moments after that, the big decisions, in the game went our way. “We’ve had penalty shouts quite regularly going against us...but today it goes our way. “And that third goal took any life out of Aston Villa - they’re key moments. “For the last 5-10 games, every single one of those key moments has gone against us. Hopefully Latics are on their way out of the first major hole since Cook took charge in the summer of 2017. And despite having guided the club to the League One title last term, Cook says he’s been feeling the pressure of late. “You know yourselves, managers go two or three games without a win and they’re under pressure,” he acknowledged. “That’s the way of the world we’ve created, and it’s not correct in any way, shape or form. “The last two times this club has been in this division, we’ve been relegated. “And this group of players - despite being really stretched - haven’t been in the bottom three. “On the back of that performance, we must look forward with confidence. “It’s been a tough couple of months for us, since we beat Blackburn at home (on November 28). “But watching us today, you could never imagine we were a team that was in trouble. “I thought from the first minute to the 90th minute we were excellent. “I thought the boys gave such a committed display full of energy, creativity, and everything we enjoy about the game. “We deserved to win the game, against a very good Villa side with some really heavy players. “You only have to look at the front players and the subs they brought on to see that. Cook saw his decision to throw in new signing Anthony Pilkington for his debut - just days after signing from Cardiff, for whom he hadn’t played this term - fully vindicated with a sterling display, illuminated by a jaw-dropping assist for the opening goal. And he was delighted to see Jacobs add the icing to his second-half cameo - his first run-out in three months after injury - capped with number two. “We’ve suffered so much with injuries this season, the squad’s been really stretched,” Cook added. “Today was the first time in months we’ve actually had decisions to make about the bench. “Football is about players - it always has been and it always will be. “Players can make managers look bad, and they can make managers look good.